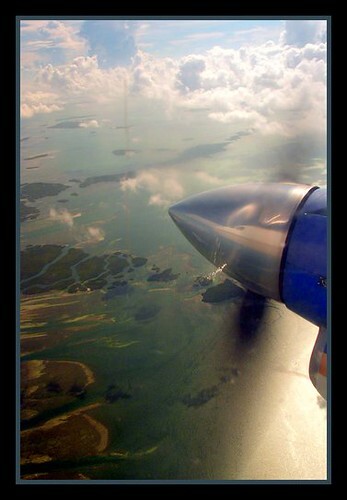 To really understand Key West and the Florida Keys, you have to start by looking down at them. It’s a view that never gets old. Fortunately most guests and visitors do start out their vacations with this view. Commercial airlines fly from Miami and Fort Lauderdale to Key West in less than an hour. The islands extend out over a hundred miles from South Florida into the sea. Only 90 miles from Cuba, Key West is closer to Havana than it is to Miami. And the islands brings vacationers some of the greatest diving, snorkeling, fishing, and sight-seeing possible in the United States. The Florida Keys are home to North America’s only living reef. Although you can get to Key West by driving (its connected to mainland Florida by over forty bridges) its awesome when viewed from an airplane! Looking Down at Paradise – The Florida Keys, originally uploaded by Key West Baseball. I can see the tabloid headings now, as soon as they find this picture: A Fish with Legs Discovered by a Computer in the Everglades! I’ve taken over 50,000 pictures since we moved to the Florida Keys. A small percentage make it out to be displayed on the mantel, or shared with family and friends. But most remain hidden away in the “virtual shoe box” I call my hard drive. I’ve recently tried out an automatic tagging service. Wouldn’t it be great if those 50,000 pictures on Flickr were magically cataloged. Then when I need one of my photos of a “beautiful sunset in Key West” all I would have to do is type it in, and “bingo” – I’d only have to look through about 2,000 pictures I’ve taken of the beautiful sunsets (and sunrises) in Key West… and Cudjoe Key… and the rest of the Florida Keys… and the rest of Florida… and Alaska… Alright, maybe the service will notice the mountains in the picture and know that picture wasn’t taken in Key West. So I tried it out! After the service cataloged some 38,000 of my photos, I typed in “fish”. The first picture the service pulled up was a river in the Everglades. It was kind of cool shot, but I had quickly discarded it into the “virtual shoe box” as somewhat mundane and ordinary. But now the photo looked a little more interesting. And I might have never found this neat picture if I weren’t looking for a picture of a “fish”. Isn’t technology wonderful? 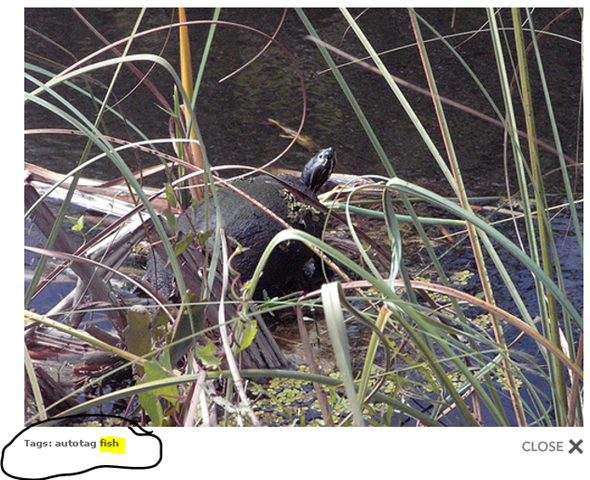 Wonder what will come up if I search for “turtle”? If you can’t live in the Florida Keys, the next best thing is to visit. If you can’t visit the Keys, the next best thing is to watch it on YouTube. The drive from Key West to the Miami airport is about 3 1/2 hours if you obey the speed limit. If you drive recklessly, as fast as you can, you’ll get there, on average, about 20 minutes faster. Really, they’ve done studies: you can risk your life and everyone around you, and arrive about 20 minutes earlier. It’s hardly worth it. In fact I tell people to slow down and leave some extra time. You’ll want to stop and take some photos, and that will add a little time to your trip. Every turn along the Overseas Highway (aka Route 1) is a scenic picture spot. But if you stop at all of them, you’ll never get to your destination. So that’s the other risk. I took this picture near Bahia Honda State Park in the Florida Keys. I like it, because it shows the Keys today, the same as it might have been in the 1920’s. This was the Florida Keys that Hemingway and later President Truman enjoyed, and it’s quickly disappearing. Now I’ll confess, I took this photo while driving by last weekend at 50 mph! I didn’t heed my own advice and stop and enjoy the view. And I know if you make it a habit of snapping photos while driving, you probably won’t make it to your destination either! So next time I’ll pull over to take the shot. Maybe I’ll even eat lunch there. Heck I carry a fishing pole in the trunk – I might as well get it out! 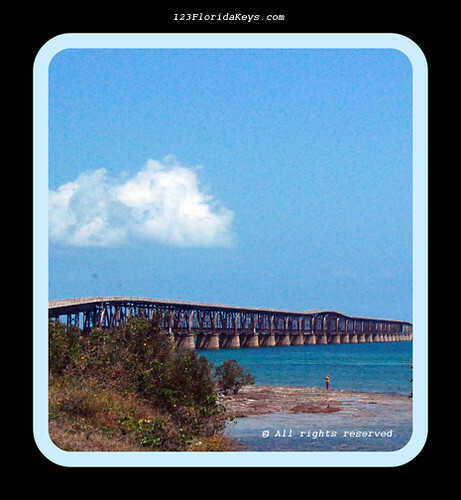 Florida Keys, Old Railroad Bridge, originally uploaded by Key West Baseball. 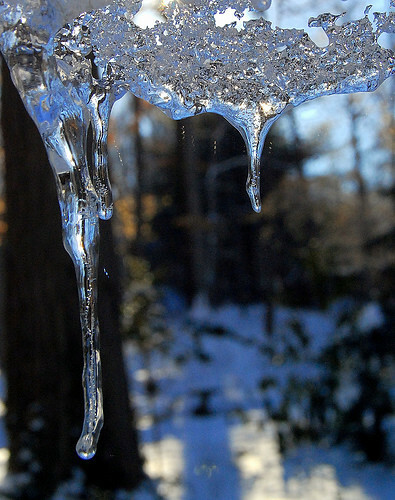 Ice is something different in the Florida Keys, than you might be use to back home. Out on the water, you use ice to keep the beer cold. And when the beer runs out, ice will keep the fish cold. Sometimes its hard to make a decision: warm beer or warm fish! Next time, remember to bring an extra bag of ice! 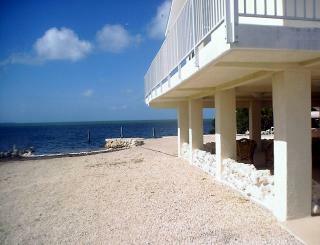 There’s not much to grab your attention as you drive through Cudjoe Key on your way to Key West. The awesome views of the water are on either end of the island, or at the end of someone’s driveway. They are not visible from the highway. 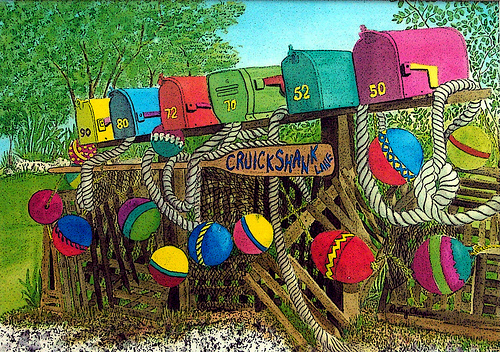 But if you’re attentive on your drive back, assuming you haven’t had too many margaritas on Duval Street, you’ll notice these mailboxes on Cudjoe Key. You may even see someone pulled off the road ahead of you, stopping to take a picture, or make a sketch. Don’t miss your chance!